Patio Furniture, Fences, Roofs and More! 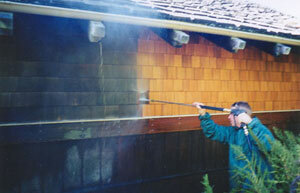 Pressure Washing is a smart and affordable way to make your home look as fresh and new as the day that it was built. 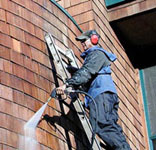 Nor-Cal Wood Restoration and Painting has been cleaning and maintaining the exteriors of fine homes and commercial buildings in Marin County for the last 15 years. 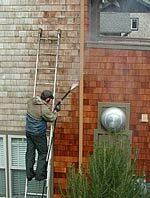 This level of experience has made us experts in the field of power washing in all the different micro climates the Marin county environment has to offer. We use this expertise to pressure wash and maintain your homes, walkways, driveways, natural stone, patio furniture, fences, roofs and more! 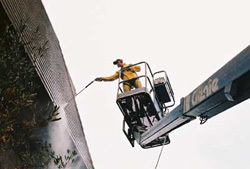 Now that you have heard about the advantages of working with our company let’s talk about the benefits you will receive from power washing your home and its immediate surroundings. One of the main benefits of keeping your home’s exterior clean is you are creating a clean and healthy environment for your family by removing molds, fungus, pollens, dirt and pollutants that can cause allergies and other respiratory conditions. 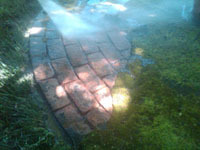 By pressure washing your walk ways you can also keep walking safe by eliminating slippery moss that has a tendency to build up in the Marin County environment especially during the winter months. 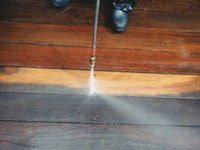 Our skilled technicians know the right pressure and technique when power washing your homes different surfaces such as decks, walk ways, fences or just cob webs and mildew to ensure no damage is done to the surface being cleaned. All of our machines and equipment are professional grade and can not be rented from a local rental company. By hiring an experienced team to do the work for you, you eliminate the risk of cleaning without the right pressure power washer or the right kind of detergents that will kill the microbial growth and eliminate dirt and prevent them from coming back. 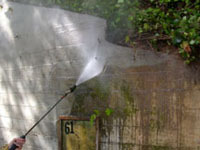 We have spoken with many home owners that attempted this process themselves or hired their gardener and ended up spending more money to get the job done right when that could have happened the first time by hiring a company that specializes in pressure washing. 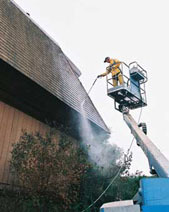 By working with our company and using it’s pressure washing services, we guarantee you a very hands on and professional experience from the time you make the call and we generate the estimate to doing the final walk through ensuring nothing has been forgotten and all personal belongings such as patio furniture and bbq’s are back in there right place. We maintain contact with you the whole way through the project to ensure customer satisfaction. There is always an English speaking workman on sight to address any concerns or questions you may have while the project is being completed. We tailor our services to meet your needs, just tell us what you want to have cleaned and we will use our expertise to get the job done! 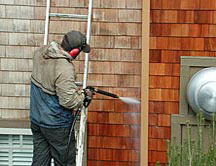 Our company has been pressure washing in Marin County and the surrounding areas for the last 15 years. We are state licensed, bonded and our employees are all covered by workman’s compensation insurance. We know the Marin County clientele; we know how to treat their homes and how to exceed the expectations of the home owner once the go ahead has been given to start work. Call us now or email us now for a free, no obligation power washing estimate!